2nd & 3rd February 2019. The event this year was hosted by the Manawatu Blokart Club at their Sanson track after Ohakea became unavailable at the last minute. The Sanson track with many of the trees now removed provided an excellent Blokart Racing venue . Many thanks to the club for stepping in at the last minute and putting the work they were starting on the next track extension on hold to get their track ready for the event. With 42 competitors registered the competition got underway on the Saturday in 12 – 15knt winds which held in all day. The course set provided challenging racing for sailors at all levels. Competition was intense which saw some very close racing. 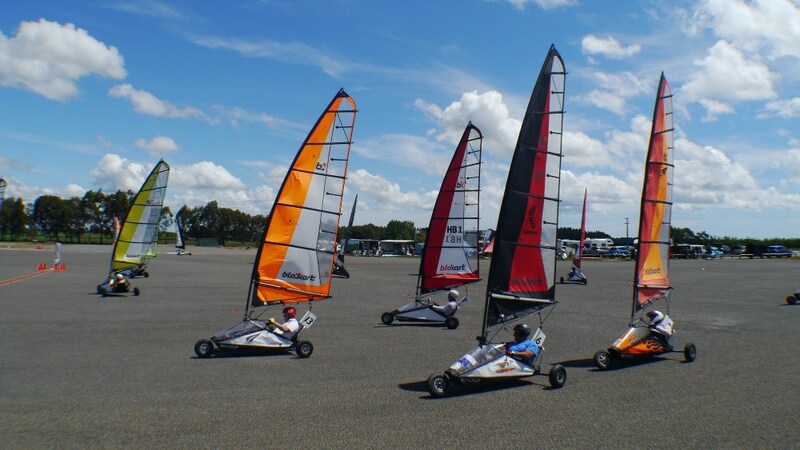 Great for the many spectators who called in to have a look at Blokart Sailing at its best. Saturday saw 43 races completed in all. Sunday, where had the wind gone? In light winds and after several false starts another three races were completed. Lunch break was called and then with no wind on the horizon the event was eventually called off early afternoon .The medal presentation was brought forward so everyone could get an early start for home. Thanks to the Manawatu club for the work that went into hosting the event. Final Results are on Speedhive. Click on following link. Below is a video from this event thanks to Michael Denton.